Organic, Vegan, and Great Resources for Doing It Yourself! After some careful research (and not so careful – I ended up somehow getting a virus and wiped my hard drive completely!) I have determined organic is totally the way to go…unless of course, you are a vegan…then vegan (of course! Duh!) is the way to go. Of course, 99 times out of 100 vegan is organic. I know it seems pretty clear-cut, but there are many reasons to go organic and be able to control what you’re putting on your body. A little back story on myself and Classically Evil. I moved out to Southern California in January of 2005 to pursue a career in the film industry. The following year I quit the industry (I had some successes and some failures, but all in all a wonderful experience) and got a job in retail. It got me thinking. I can do this myself. I can do it better. I can make it personal. I started working on the concept for Classically Evil back in 2006. It originally started as a clothing line concept – 1940s inspired gothic. I started doing research and kept working at my own style. Then one day it hit me: Bath and Body Products. With the vegan and organic revolution taking hold over the next few years, I decided I would start making my own and noticed a huge difference in my skin. I starting bringing my products to work (lip balm and lotion) in 2011 and testing it out on people. I started donating my products and giving them away as gifts. I got a lot of very positive feed back and decided to quit my day job and pursue Classically Evil full-time. Now I go around and encourage everyone I meet that they should make their own scrubs, soaps, lotions, and masks. You can control what goes on your skin – no harsh chemicals. I can’t tell you how many times I’ve gone to a store, looked at the bath/body products, smelled them (smelled great), and then looked at the ingredients and couldn’t pronounce them let alone know what it does for my skin. Before I started making my own product, I used a particular brand of body scrub. I loved the way it smelled and made my skin feel. For $8 I got 18oz. The first three ingredients are Sucrose, Glycerine, and Polysorbate 20. The body scrub you can make yourself has only the ingredients of epsom salt, sugar (I like to use organic sugar), and extra-virgin olive oil. It’ll only cost you about $8 to make 24oz (roughly). And the craziest part of all of that: it is more EXPENSIVE than the organic counterpart you can make yourself. Some basic ingredients that you have around your house that are commonly used in bath and body products: epsom salts, sea salt, sugar, baking soda, honey, extra virgin olive oil, sunflower oil, vitamin e oil, coconut oil, oats, lemons, and tea. It’s always great to have chamomile and lavender on hand. Maybe growing it in a garden. This year I started growing my own herbs and vegetables on my balcony. We’ve been using them quite a bit and it’s a ton of fun. You’d be amazed as to how useful and easy (on your health and wallet) it can be. As I am working on this, I am currently checking out a couple of Etsy Online Labs for marketing and branding. Always learning this one right here. If I find out anything cool, I will try to pass it on to you guys! I have a few resources below for you to check out. A few books, websites, and stores that I use as wonderful resources. I’ll keep you all up to date if I find any other cool sites or books. I’d love to hear from you guys if you know of any great sites/books/stores you use that you can recommend! Natural Beauty at Home. Janice Cox. Holt Paperbacks. 2002. Organic Body Care Recipes. Stephanie Tourles. Storey Publishing. 2007. 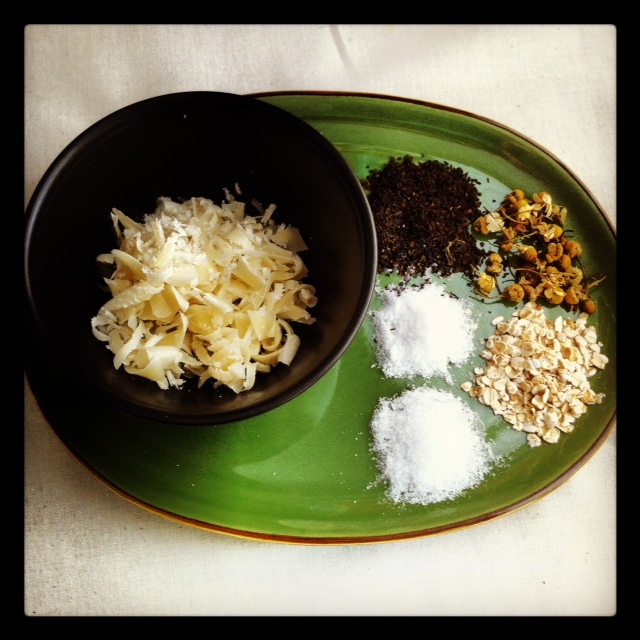 Making It: Radical Home Ec for a Post-Consumer World. Kelly Coyne & Eric Knutzen. Rodale Press. 2010. Mountain Rose Herbs. They’re great for organic and vegan products. You can get just about anything. They’re a little more expensive, but you pay for convenience. Lip Balm Tubes.com. They’ve got the lip balm basics as well as vegan alternatives. 99 Cent Store. Surprisingly great location for basics like Epsom salt (2lbs. for $0.99), Vitamin E oil (4 oz. for $0.99) for instance. Trader Joe’s. If you are anywhere near a Trader Joe’s they have Coconut Oil ($7 for 16oz.) and Jojoba Oil ($8 for 4oz.). Sprouts (formerly Henry’s). You can get Essential Oils (and do some fun research for organic beauty products) here. They’re a little expensive. However, keep an eye out for sales. Occasionally they go on sale for 20-25% off. Smart & Final. Great for spices that you can put in your products. 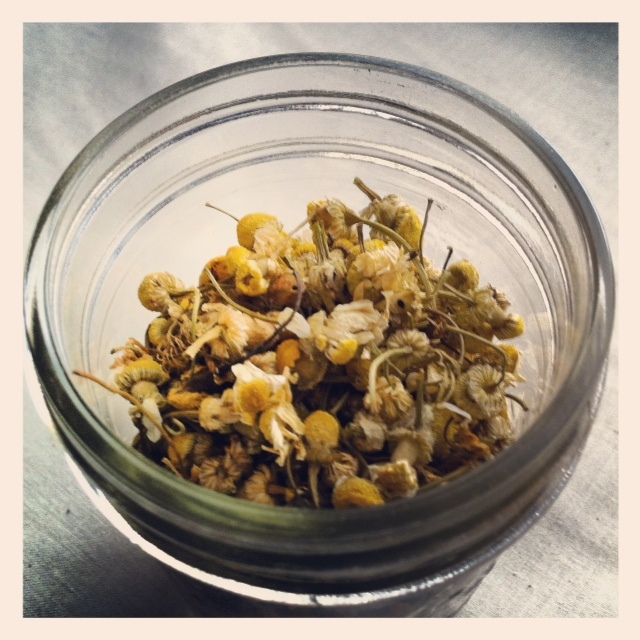 I believe I got a 1/4 oz bag of dried chamomile flowers for $0.99. Not too shabby.